I found these polyhedral lights while I was walking around the old town of Riga. Each light has a hexahedron and a square pyramid on it. Once again Mathematics are used for beauty purposes! The House of the Blackheads (Melngalvju nams) is located in the heart of the old town of Riga. 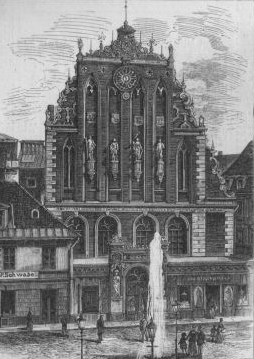 It’s a building erected in the first half of the 14th century for the Brotherhood of Blackheads who was an association of local unmarried ship owners and merchants founded in the 14th century. The house is one of the most folkloric buildings in the city because of its ornamentation built during the XVIth, XVIIth and XVIIIth centuries. In the Second World War, the house was destroyed by the German bombs (1941) and the current picture was built in the period 1995-1999. I’ve been in Riga twice and I’ve always admired this beautiful house! And the astronomical clock on its front! The clock has three circles. The upper one indicates whether it is day or night and the the lower one points to the day of the week. The main clock is a calendar (days and months) and a analogical clock (hours and minutes). I want to return to Prague to enjoy its great astronomical clock but I think that this one can be just as interesting as the Czeck one! 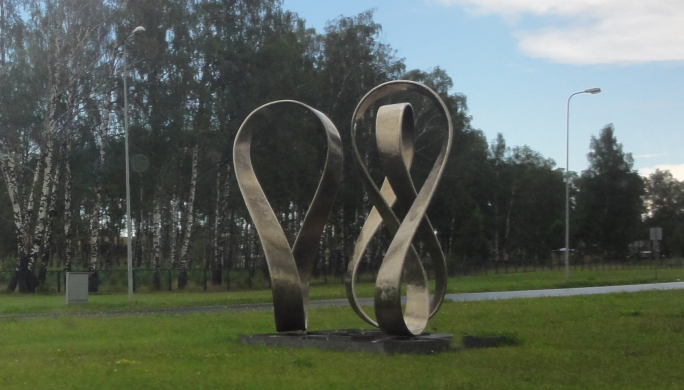 When you go to Riga from the airport by car, you go through Kārļa Ulmaņa gatve and at the beginning of Lielirbes iela you can see these three Möbius strips. The Möbius strip was discovered independently by Johann Benedict Listingand (1808–1882) and August Ferdinand Möbius (1790-1868) in 1858 and it’s a very curious non-orientable surface. It’s a good welcome sculpture to the city!